There is something dreadfully wrong with the human ear. It can hear almost any note in the sound spectrum, but when taking in the many tones produced by a group of different instruments, if there isn’t a low tone, the sound is thin, wispy, lacking. Not many instrumental groupings, other than classical string quartets and bluegrass trios, survive very long without the low end: bass. Long ago I took a class in the physics of music, and even the esteemed professor couldn’t really answer the mystery of our need for bass. "It just sounds better," he said. There was a time when rock’n’soul engineers mixed the sound of the double bass or bass guitar in with the bass drum. They knew they needed it, but had no idea what to do with it. It wasn’t until the emergence of such bass masters as James Jamerson, Charles Mingus, Scott LaFaro, and Paul McCartney that bass was recognized as something other than an aural necessity. They and many others demonstrated that bass could deliver a contrapuntal line, a second harmony, or freeform modality. I play a Fender Jazz Special, and I love it. I’m not very good, but I hold John Patitucci, Rob Wasserman, John Entwistle, Jaco Pastorius, Duck Dunn, and a host of others in a special place in my heart. They’re bassists. They hold down the bottom. Subwoofers should seek them out and pay homage. There are two basic approaches to bass. First, there’s the technical approach: what we do here, which deals with the hi-fi reproduction of bass, what works, what doesn’t -- what has become known as bass management. There’s another approach, though, which considers bass, especially the stand-up double or string bass and the electric bass guitar, as the apotheosis of modern rock and jazz. So when I approach a subwoofer qua subwoofer, I give equal weight to its technical qualities (i.e., why you’re reading this) and its ability to convey the emotional seat of the sounds I so love. Bass management is as much art as science. What may measure optimally may alternately under- and overwhelm the listener. Crossover points are meticulously calibrated, only to boom at tender moments, then poop out as whole planets crumble. Then there’s the question of placement. There are aficionados of room corners and lovers of the open air, as well as those who prefer subwoofers to be placed behind a wall or between the floor joists. And after you’ve taken all that into consideration, there’s the room -- and no two rooms seem to behave the same. What murmurs politely in one venue blasts shamelessly in another. 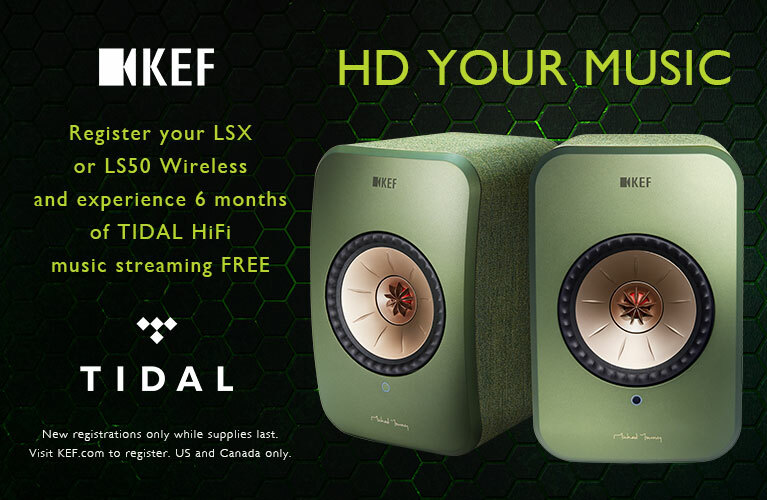 The science captures low-frequency signals and spins them into hefty woofers with dedicated power supplies. The art fiddles with subwoofer positions until the sub sounds as well as it’s going to -- in your room. It probably goes without saying that Velodyne is, odds on, the first name conjured when one hears the word subwoofer, so rich is their history and so numerous their achievements. Among their considerable innovations are the small-footprint sealed-box sub; the high-powered, low-heat Energy Recovery System (ERS) class-D amplifier that claims a "green" 95% efficiency; and the room-bass correction that makes linear the sound in your room. 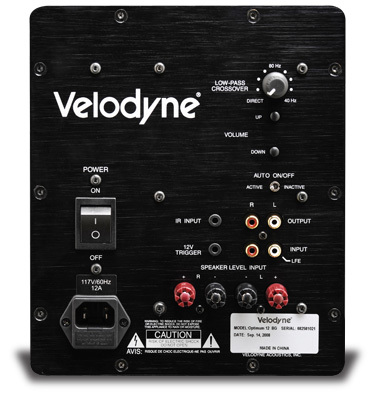 In one sense, the Optimum series represents the culmination of Velodyne’s many innovations. 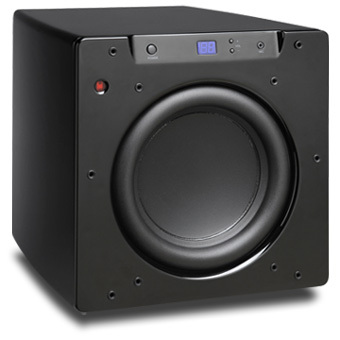 Each sealed-box Optimum subwoofer has an ERS amp, occupies a dinky footprint, and uses software (a microphone is supplied) to automatically tailor the sub’s output to the room. Indeed, one could suggest that this auto-EQ approach, first developed for Velodyne’s SPL series in 2005, takes the dice roll out of room placement. The Optimum-10 ($1199 USD) measures 13.5"H x 13"W x 15.2"D, weighs 43 pounds, and sports a 1200W ERS amplifier driving a 10" front-firing woofer with 3" dual-layer voice coil. The controls are simple. The front panel has a power button, a two-button volume control, an LED display that tells you what your output setting is, and the equalizer’s microphone input. The rear panel contains the master power switch, power-cable receptacle, low-pass crossover control, the second of three volume controls, line-level inputs and outputs, speaker-level inputs, and a switch that toggles between Active and Standby modes. The latter function lets you leave the subwoofer on all the time, but it doesn’t electronically engage until it detects an input signal. One line-level input is labeled LFE, for an A/V receiver’s subwoofer outputs. You can use the sub’s crossover filter, your receiver’s bass-management crossover, or both. This is an improvement over many powered subs, in which the sub’s own crossover is defeated by connecting the LFE and the amplifier’s subwoofer output. Finally, there’s an IR sensor input: If the Optimum-10 is placed where it’s difficult to use the remote, a third-party IR sensor can be connected. A 12V trigger can be engaged for ancillary equipment so fitted. The Optimum-10 comes in your choice of Gloss Black or Cherry veneer. However, the business controls are on the Optimum-10’s remote control. Here is found another power switch, which turns the unit completely off. (The manual suggests that this control forces the unit into standby mode, but a quick check with Velodyne confirmed my experience: the remote’s power switch replicates the master power switch on the rear panel.) There are four phase settings: 0, 90, 180, and 270 degrees. Once you’ve set everything else up, you listen with each phase setting and choose the one that sounds best. A Mute button does exactly that. The Night switch limits the Optimum-10’s dynamic output power and is designed, as its name suggests, to lower the power output at night, when you might risk disturbing the neighbors. A Light button toggles the front panel’s LEDs on and off. The EQ button calibrates the onboard seven-band parametric equalizer (more on this in a bit). Finally, there are four EQ presets: Movies, Rock, Jazz, Games. Each of these alters the subsonic filter frequency, EQ frequency, EQ level, and volume differential to complement what you’re listening to. Only the Jazz setting alters only the subsonic filter without touching the equalization. The Optimum-10 is shielded from interfering with video displays. Setup was a breeze. You plug the sub in. Connect the Subwoofer Out on the nifty Onkyo TX-NR808 receiver to the LFE input on the Optimum-10, and you’re in business. Well, almost. The magic in this puppy is the parametric equalizer. Velodyne supplies a dinky omnidirectional microphone, a dinky stand for it, and a 20’ cord to connect to the input on the front panel. You plug the mike in and locate it at the primary listening position. When you press the EQ button on the remote, the Optimum-10 generates 12 sweep tones; listening to these tones through the mike, the Velodyne’s software measures the effects that the room’s dimensions, walls, and furniture have on the sound, then programs the sub’s equalizer to account for them. Move the sub or the furniture, and all you have to do is plug the mike in and run the sweep tones again. "Yeah, so what?" I hear you say. "An equalizer. Good audiophiles generally avoid equalizers." Well, friend, the proof is in the listening. Once you’ve set up the Optimum-10, you’ll hear bass as you’ve never heard it before. I set the crossover at 80Hz on the Onkyo and disengaged the Velodyne’s crossover. After the Optimum-10 was installed but before doing any critical listening, I recalibrated my MartinLogan surround speakers. I’ve had a lot of powered subs hooked up to my A/V rig. Each had its own characteristics: bone-rattling depth, sublime tonal accuracy, unimpaired loudness. All have done the job satisfactorily in one fashion or another, but none has done everything so very, very well as the Optimum-10. In Enya’s Watermark (CD, Reprise 26774-2), deep synthesized bass is the order of the day. From the root punctuations of "Cursum Perficio" to the pedal rumblings of "Storms in Africa" to the Stygian bridge in "Orinoco Flow," this CD challenges not only a subwoofer’s ability to reach down and grab the notes, but to render them with distinct clarity. Set to Rock, the Optimum-10 did it all, note for note. Similarly, Jellyfish’s landmark Bellybutton (CD, Charisma 91400-2) is a minor miracle of modern engineering; Jack Joseph Puig somehow dialed in the precise amount of bass for each track. Jason Falker’s opening to "The Man I Used to Be" burrowed to just the right depth, and John Patitucci’s upright bass in "Bedspring Kiss" flowed so smoothly it inadvertently took over the track -- just like Rob Wasserman’s upright in "Night Train," from Bruce Cockburn’s The Charity of Night (CD, Rykodisc RCD 10366), an instrument of propulsive energy and grace. Don Dixon’s sublime bowed upright in the title track of Marti Jones’s Any Kind of Lie (CD, RCA 2040-2-R) precisely trembled through the Velodyne, just as his electric bass in "Second Choice" gently and firmly led each chorus to resolution. Dixon is a bassist, and it’s no mistake that the low end is prominent in any recording he produces. Rob Wasserman’s performance in "Night Train" brought into stark relief the difference between MP3 recordings and bona-fide hi-fi. I first heard the song on Radio Paradise, and commented that I loved "the guy cookin’ on fretless." After hearing the CD, it was massively apparent that he was playing an acoustic double bass -- the sonic differences between the two instruments are obvious, but were not apparent on the MP3 over the radio, even through excellent PC speakers like my Audioengine A2s. Finally, I’ve never been much of a Bruce Cockburn fan (I know; don’t start), but The Charity of Night is a terrific album that I can’t recommend highly enough -- especially when its low end is reproduced by the Velodyne Optimum-10. Now set to its Movies mode, the Optimum-10 took my DVDs to places they hadn’t been. A word about the function of deep bass in movie soundtracks: We all know and are all familiar with the thundering rumble of space cruisers (the Star Wars effect), massive explosions, and the sickening crunch of large machines with too many wheels. Generally, those kinds of rumbles are associated with some real image, action, or artifact on the screen -- but they barely scratch the surface of what the low end can do. The artful film-sound engineer will deploy bass to create atmosphere, to signal some meaning to the viewer, be it foreboding, dread, a portent of change, and so on. So uniquely refined was the Optimum-10’s sound that it gave me wonderful insight into the many duties of bass in a soundtrack. Guillermo del Toro’s sublime Hellboy opens on a remote Scottish isle, where Der Führer’s Requisite Cast of Pure Evil (c.f. Raiders of the Lost Ark), aided by one Grigori Rasputin (it’s a comic book, fercryinoutloud), prepare to unleash some tentacled nasties, the Ogdru Jahad, on the planet. At one point a Klieg light is sucked into Rasputin’s cosmic vortex past the Jahad, flailing helplessly in its crystalline prison. What I heard was a marrow-curdling rumble -- not the sound of the Jahad so much as a portent of doom, a not-so-subtle warning that these übersquid weren’t to be trifled with. Bass can also enhance the illusion of very large spaces bounded by very large doors, gates, windows, what-have-you. In chapter 5 of Hellboy, Agent Myers’ descent into the FBI’s Bureau of Paranormal Research and Defense was accented by deep, heavy, metallic clanks as trap doors shut and walkways magically appeared onscreen. Even the vault-like door to Hellboy’s apartment (chapter 6) punged dully as the tumblers laconically fell into place. It is the reverberant bass dialed into the soundtrack that give these illusions their depth and authenticity -- artifacts that the Optimum-10 rendered with conviction. Alex Proyas’s flawed I, Robot, with its plot holes (how do Spooner and Calvin know where each other lives?) and ill-conceived characters (what exact purpose did Shia LaBeouf’s street urchin fill? ), is nonetheless occasionally compelling sci-fi, if only for Will Smith’s screen presence and the loving care with which Sonny (voiced by Alan Tudyk), the almost human NS5 robot, is drawn. This is one movie that uses atmospheric bass to marvelous effect. In chapter 14, the deep bass in Marco Beltrami’s background music signals danger as Smith’s Det. Del Spooner approaches Dr. Lanning’s mansion -- a portent of dread that is quickly fulfilled. Similarly, in chapter 31 every other downbeat in the score is heavily accented with bass, building the suspense as Spooner and Calvin approach the USR Building for the final showdown. The latter scene was noteworthy because, for the first time -- and I know this movie’s sound pretty well -- I could hear timpani mixed in with something else harsh and uncompromising, the two and maybe more sounds instilling in me an edge-of-the-seat anticipation. I’m not sure I’d heard the timpani before. And in genuine action scenes -- the rolling out of the NS5s (chapter 16), their attack on Spooner (chapter 18), the fierce rumbling of the USR trucks, the crash of Spooner’s Audi (product placement at its finest) -- the LF effects boomed prodigiously, such was the bass power created by the Velodyne Optimum-10. 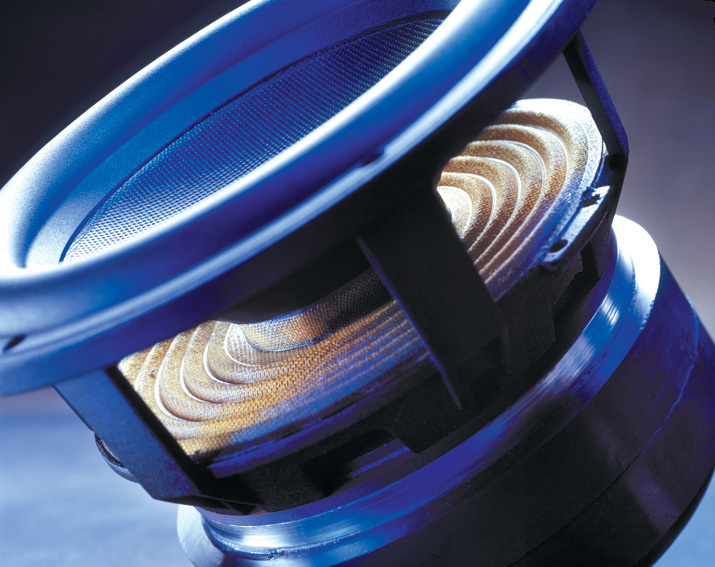 There is no such thing as the perfect speaker, and that more than likely applies doubly to subwoofers -- too much can go wrong. However, the combination of an inky-dinky footprint, an overabundance of power, a modest driver, and its room-correction equalizer makes the Optimum-10 as close to perfect a subwoofer as I’ve heard. Musical bass was musical; atmospheric effects were stratospheric; and plain ol’ Hollywood CRASH! BAM! KA-BOOM! action hijinks were rendered with joy and abandon. Indeed, this is one subwoofer that stood out because of what it didn’t do: The Optimum-10 never once exhibited any bloat, fuzzy rendering, or aural flatulence. If there were standing waves bouncing about my A/V room, they were barely noticeable. What the Optimum-10 delivered was honest, bona-fide bass: clear, crisp, and clean, with no sense of strain or needless rattling. I will return the Optimum-10 to Velodyne with great reluctance. If there is a subwoofer out there that delivers the brand of honest sound that the Optimum-10 does, I want to hear it. But folks, I’m not sure it exists. The Optimum-10 is an outstanding audio product. Highly recommended. Warranty: Three years parts and labor, electronics; five years, driver.